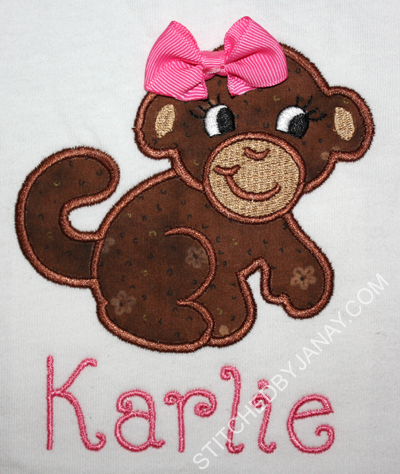 I picked a different font than Kylie's, wanting one that would fit in my 6x10 hoop without a lot of shrinking or skewing, and settled on Applique Momma's Anna Kate font. 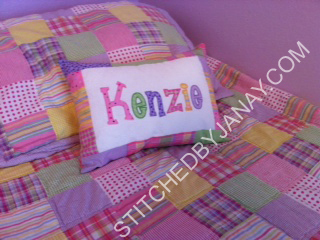 I picked all the fabrics by looking at an iPhone picture of Kenzie's bedspread, and you would not believe how perfectly it coordinates -- I was SHOCKED! 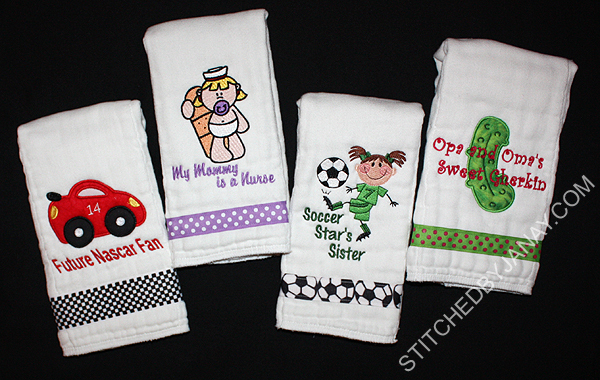 Sue requested lots of neat custom items for her new granddaughter. 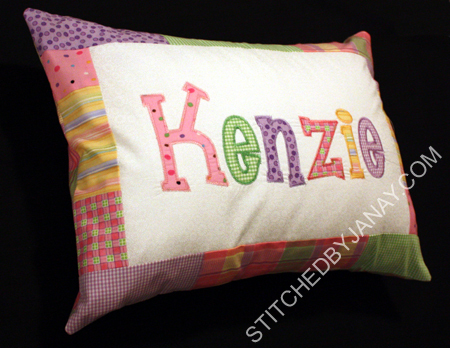 I enjoy getting orders from Sue because it stretches me to be creative! This is going to be an imaged filled post, so I'm going to do my best not to be too wordy or you'll never make it to the end. And I'll never get it published... most of this was made at the very beginning of April! 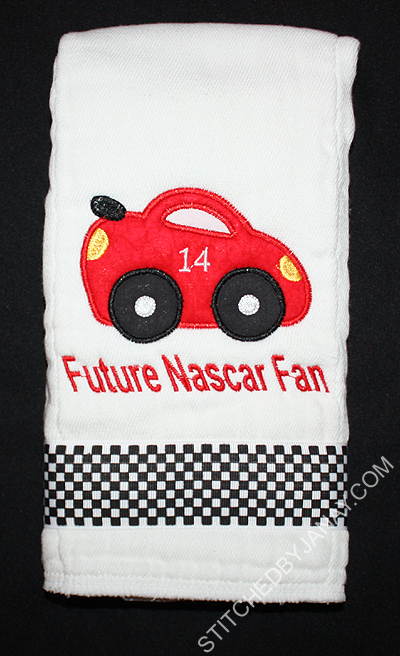 Daddy is a big Nascar Fan, so I used this race car from Designs by JuJu's Speedy Race Cars set. I deleted the number it came with and inserted in the number of his favorite driver with Embird Alphabet #16, and added the text with #2 (skewed with an envelope function). Mommy is a nurse and loves purple. Sue asked for a design like the baby doctor design I have used in the past. 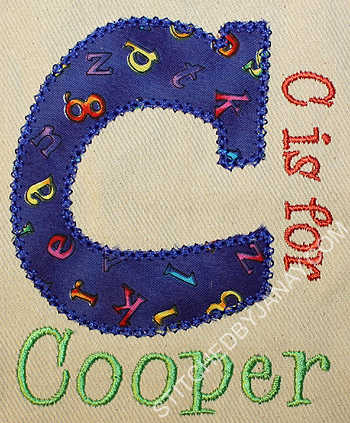 I found this one in my stash from Artistic Threadworks, and added the text with Embird Alphabet #7. 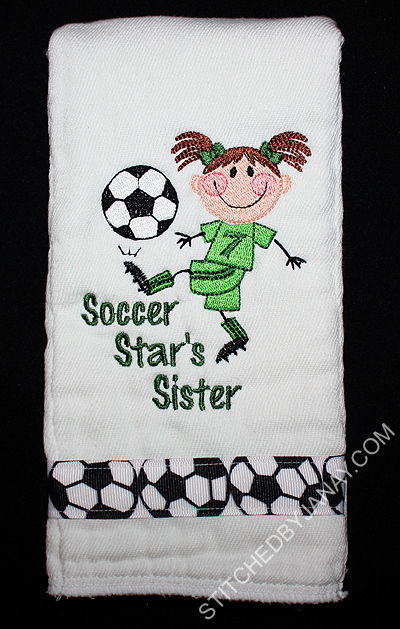 Big sister is quite the soccer player and loves green, so we created this. 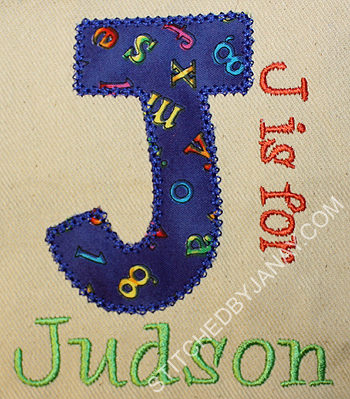 I used a design from DBJJ's "The Stix Kids Play Sports" set, and Embird Alphabet #8 for the text. And this one requires a bit more explanation... Mommy is called "Aunt Pickle" by other kids in the family, so from the beginning of the pregnancy Sue's husband named the baby "Sweet Gherkin." 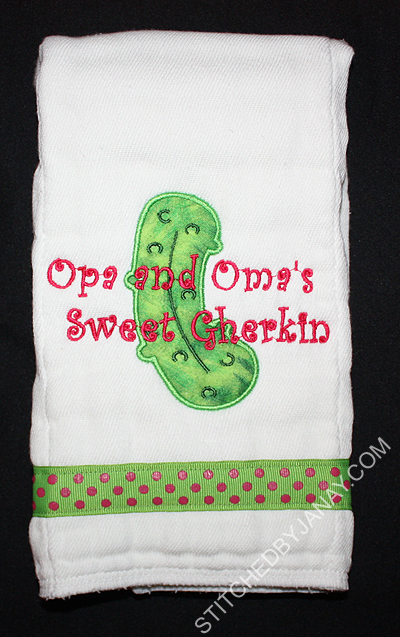 The pickle applique is from Applique Alley and I used Embird Alphabet #17 for the text. 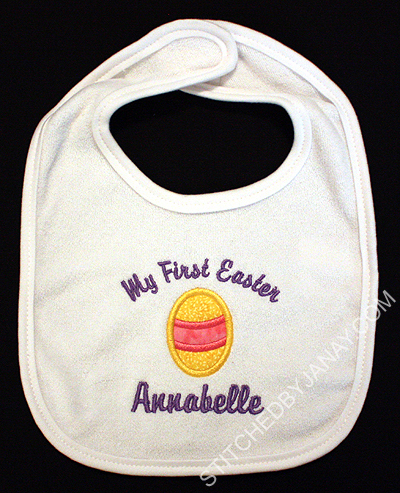 The next thing Sue wanted was a set of holiday bibs for Annabelle. I've gotten the first two done, but still have several to go. 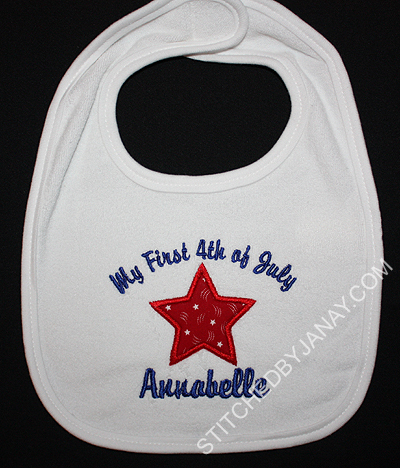 For Easter I used an egg from Lynnie Pinnie's Egg Trio and for the Fourth of July bib I used a freebie star from My Embroidery Haven's yahoo group. I used alpha #7 for all the text. Back in April I participated in a challenge where we were supposed to do a design two ways: first using our usual methods/materials/techniques that we are comfortable with, and then a second time thinking outside the box. 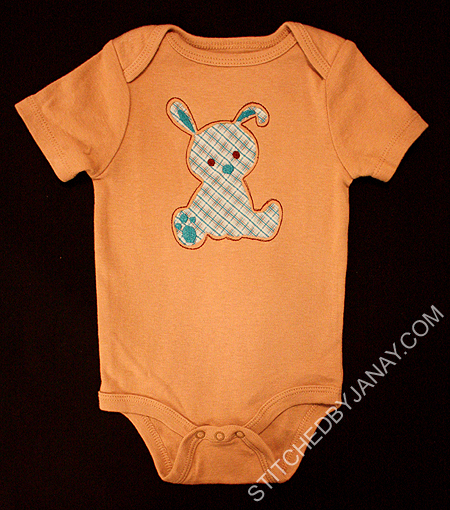 I chose Planet Applique's Baby Bunny design, I think it's the sweetest little bunny! 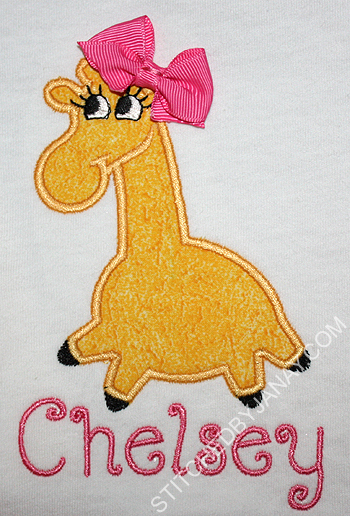 A couple years ago I made this shirt for my daughter's friend--A pink girl's shirt, using minky for the applique patch. Sweet and soft and just the way the design was meant to be stitched, right? For my second stitch out, I took the instructions "Do something you haven't ever tried before" seriously! I attempted reverse applique for the first time! I hooped stabilizer, applied spray adhesive and laid down a rectangle of the plaid fabric. 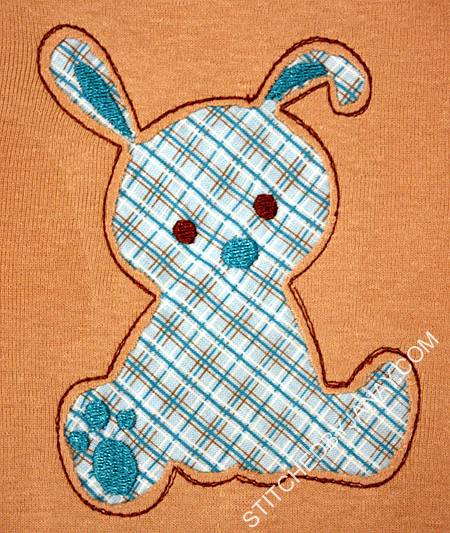 I ran the placement stitch on top of that, then jumped to all the detail stitching (ears, eyes, nose, pawprint). Then I removed the hoop from my machine and attached the onesie, pinning it in place. 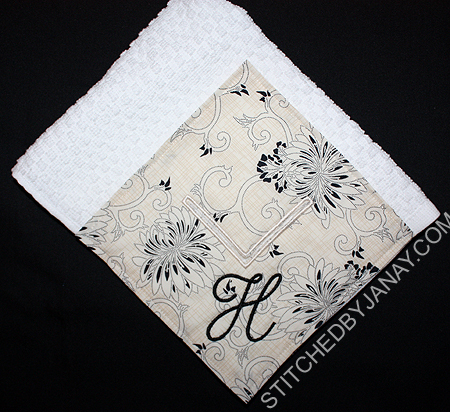 Then I went back to my machine and ran the tackdown stitch line 3 times (to kind of give a triple bean stitch look). 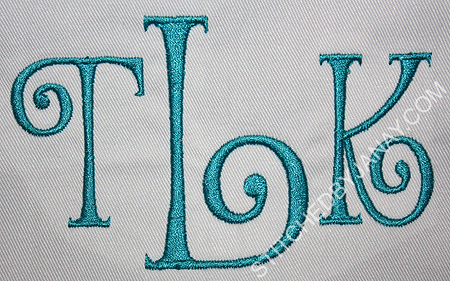 I completely skipped the satin stitches. I took the onesie out of the hoop, trimmed away the inside of the knit exposing my little blue bunny. And in this case some of the detail is lost, like outlining the arms and around the paws, etc. It really gives it a simplistic look which I'm fine with, but something to consider when converting a tradition applique to a reverse applique. I see more experiments in my future! 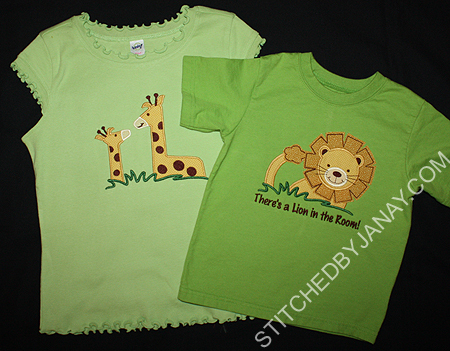 Ann asked me to make a set of sibling shirts for her niece who has two boys and a new baby girl. She gave me freedom to do what I wanted, so I took the opportunity to finally use MCA Applique's Big/Lil Bro/Sis design set. 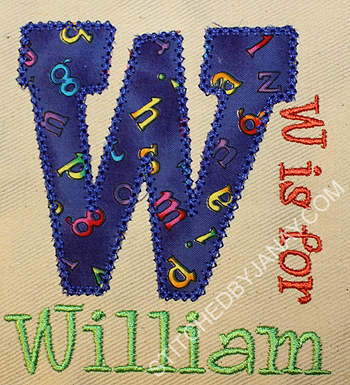 Every.Single.Time I see these designs in use by other embroiderers I fall in love with it all over again! The designs come with "lil'" and "big" already there, and you can purchase MCA's Angelina font to add the names. However, 8 Claws and a Paw has it's own version of this same font (Thin Lizzy), so I personally didn't purchase MCA's, but used what I already owned. A quick word of caution... 8CP's version is thin (hence the name!) so if you want the thickness of the name to match the thickness in MCA's design, you'll need to adjust the pull compensation in your software with 8CP's, or buy MCA's. The siblings designs don't come with extra little add ons. 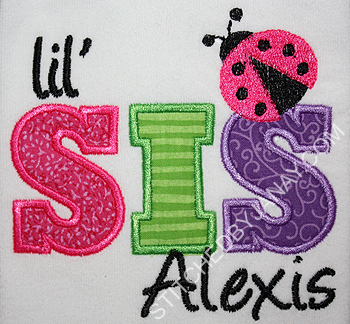 MCA sells several applique designs appropriate for that so you can truly customize the shirts for each sibling set. 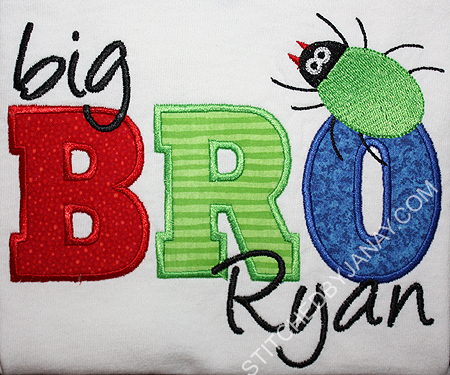 However I was looking for some sort of critter that was appropriate for a 6 year old boy and I settled on Applique Momma's Bug Mini design for the boys and the Ladybug Mini for Alexis. They turned out pretty cute! 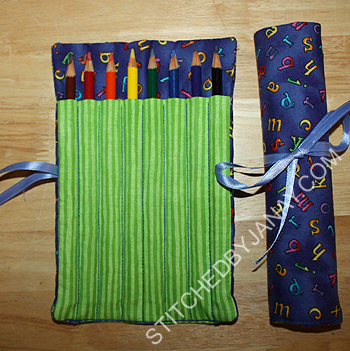 For the second one I used one of my favorite ribbon/fabric combos. 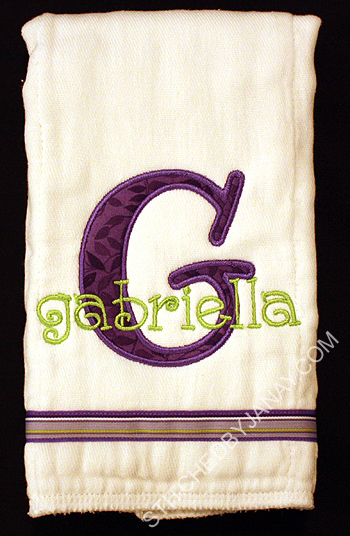 I picked Embroidery Boutique's new Cute Applique font for the "G" and added Gabriella with 8CP's Swirley font. 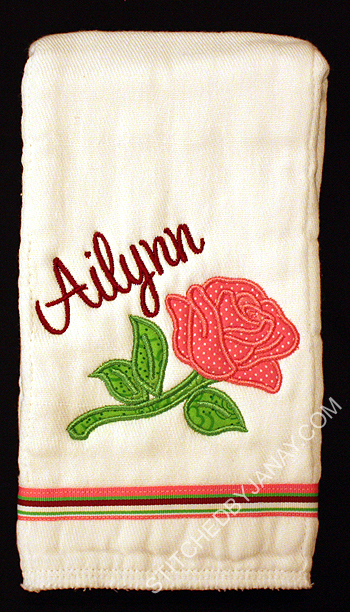 Brice and Tiffany plan to name their daughter Ailynn Rose, so I used this long stem rose applique I found in my stash from Newfound Appliqué, adding her name with 8CP's Sweet Tarts font. Brice is a Marine. 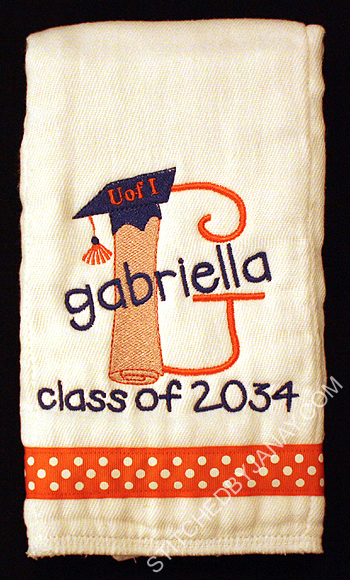 When my friend Brittany requested this burp cloth, I knew someday I would make it again. :) It's one of my all-time favorites! 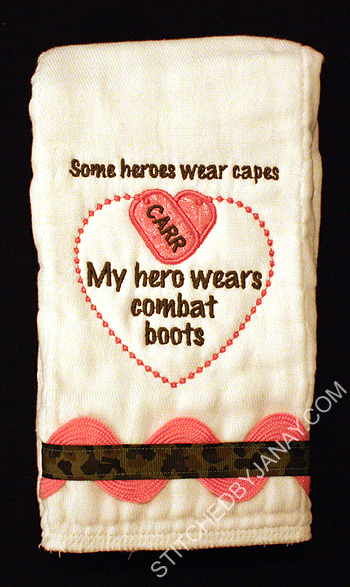 The applique dog tags design is from Planet Applique. I used Embird Alphabet #2 to personalize the dog tags, and #8 for the rest of the text. 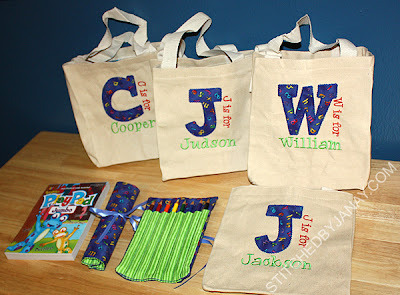 My original plan was to monogram these tote bags simply with their first initial and be done, but I was inspired by several teacher appreciation projects I've seen posted on groups/forums and opted to go this route. I used Embroidery Boutique's Fun applique alphabet for the monogram, and used 8CP's Whoa Nelly to add the "J is for Jackson". Can you stand another turquoise owl?! Last week was teacher appreciation week at my daughter's school. In addition to a gift for her teacher, I also wanted to donate something to the Assistant Principal's stash of door prizes that she gave away throughout the week to teachers. I've known about this... well since last year. But unfortunately personal projects with far off deadlines tend to get bumped to the bottom of my to do list until the last possible moment. Thankfully Sheila saved the day! I had a morning to myself to sew and was cranking through projects as fast as possible. I knew I wanted to put an owl on an apron for this donated gift, but WHICH OWL?? Before I had a chance to decide, Sheila asked if anyone was available to test this cute owl, so I hopped on the opportunity to help her and get my project done at the same time! Isn't the owl cute? Hop on over to her etsy page and grab the Savvy Stitches' Kookie owl while it's on sale, only a few are left at that price. 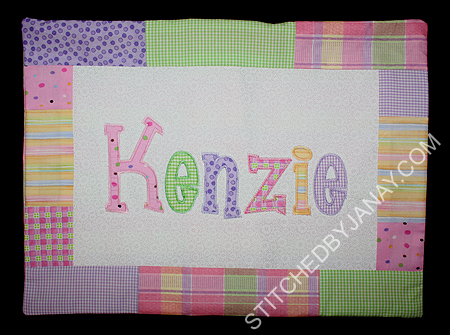 :) This is the 6x10 size, and was a great opportunity to use this large scale turquoise gingham that I added to my stash last summer. 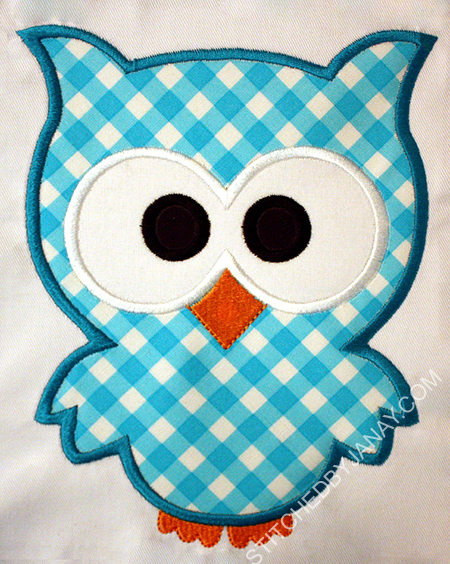 Now, in all honesty my plan was to slap the owl up on the bib part of the apron and be done. 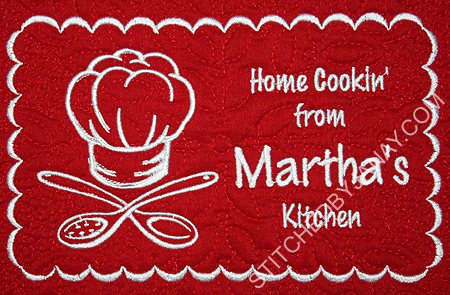 But as I was pressing the apron I noticed some marks down on the bottom. Phooey, no time to apply stain remover and wash, no time to go buy a new apron. That required a new plan! 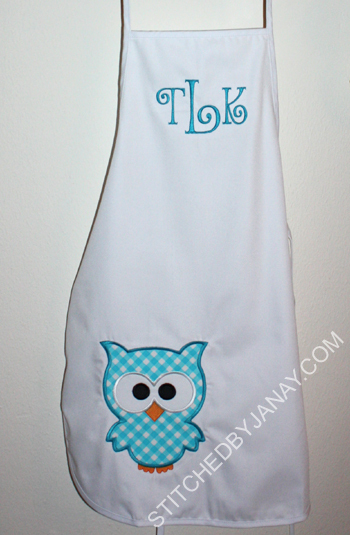 Put the large owl down at the bottom to cover the marks, and offer free monogramming to the teacher who won the apron. I like it even better this way! I used Golden from 8 Claws and a Paw. 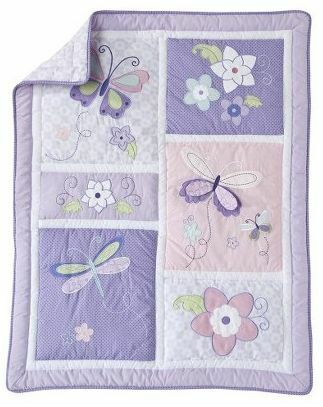 It's the right mix of pretty and whimsy to go with the kookie owl. A few weeks ago I got an order that I almost turned down since my to do list was lengthy and I was heading into a crazy couple of months. But I entertained the idea and I'm so glad I did! 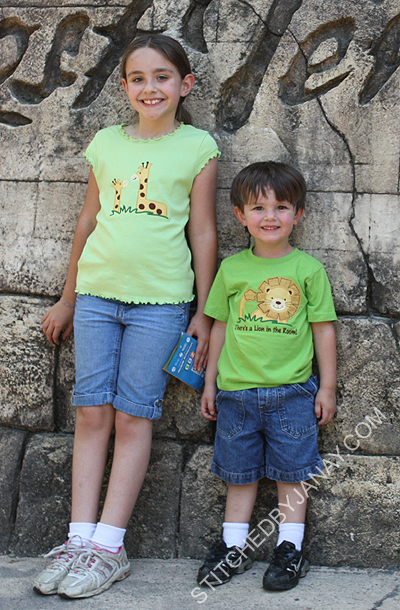 Nicole requested shirts for a set of cousins to wear to the zoo. 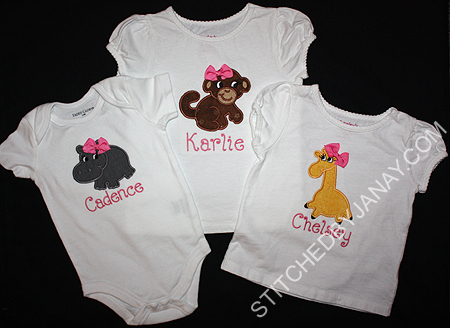 She wanted each to have a different animal (hippo, monkey, and giraffe) and wanted them to be girly -- eyelashes and bows. Initially my thought was, oh dear, how will I find a set of those designs? I started by using one of my best friends --google image search. 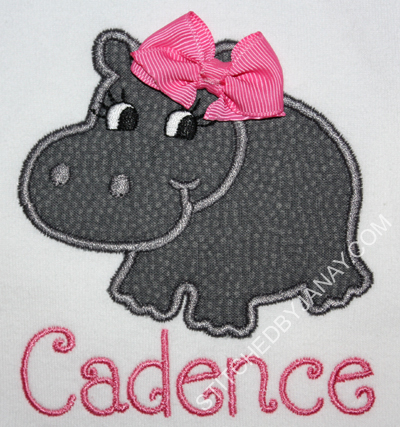 I searched for a hippo appliqué design first, since I figured that was less common than the giraffe and monkey. Lo and behold, a cute hippo image popped up... A design I already owned!!! 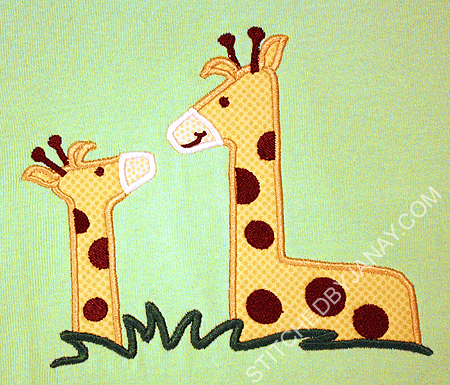 I hopped over to my Embroidery Library design folder to see what other appliqué animals I could find, and would you believe I also had a monkey and a giraffe?? Crazy I tell you. I had purchased both the Baby Animals and Noah's Ark sets from Embroidery Library YEARS ago, and completely forgotten I had them. So just like that I found matching animals! My next step was to use another best friend -- Embird. I resized a couple to make them a touch larger, and then these animals needed eyelashes. 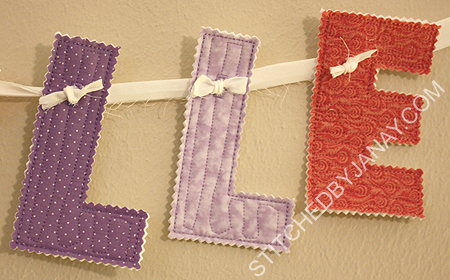 I plucked them off of a Lynnie Pinnie design in my stash and inserted them onto my animals. Instantly girly! Ta-Da! Their names were added with the Bonnie font from 8 Claws and a Paw. Daddy's Taking Us to the Zoo Tomorrow! 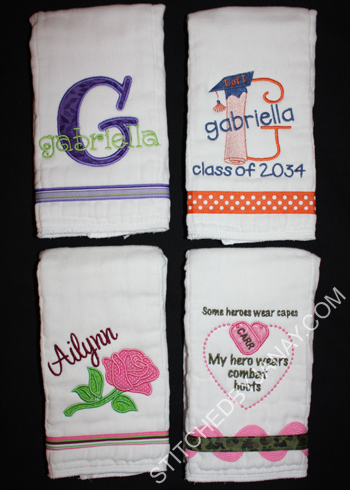 Aren't these designs cute? It was my first time stitching MCA designs (I think) and they stitched very well. The challenging part was deciding what fabrics to use. I was pretty excited to find three different shades of yellow/tan with tone-on-tone dots... They worked great for both designs! I picked MCA's Lion for Dashiell. 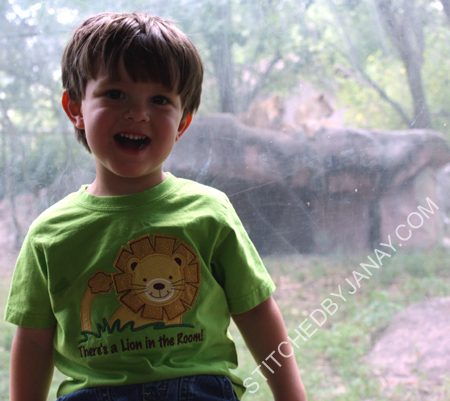 He's been asking for a lion shirt for a while and this is the cutest design I know of. :) The mane is raggy, and now that I've washed it twice it's frayed nicely, super cute! 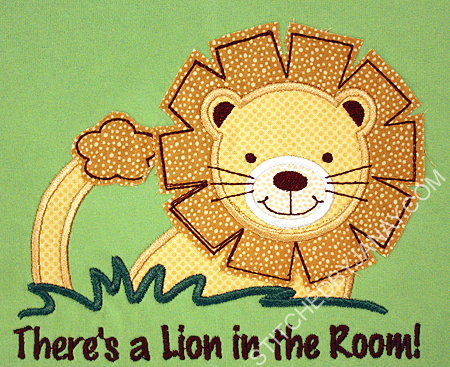 I added the phrase "There's a Lion in the Room!" because Dashiell goes around saying it often. We have no idea why or where he got it from, but it's really funny, and we wanted to document this fun stage. Annaliese chose MCA's Giraffe Pair. Wouldn't this design make a great Big Sister shirt?? She wasn't down with that idea though. She wanted me to add "Two heads are better than one" but I opted to leave it off (for space reasons). She's brought it up a couple times since, so I may be rehooping the shirt... The one request I did permit was leaving the smile off of the little one. I'm not sure why she thought it was cuter without. 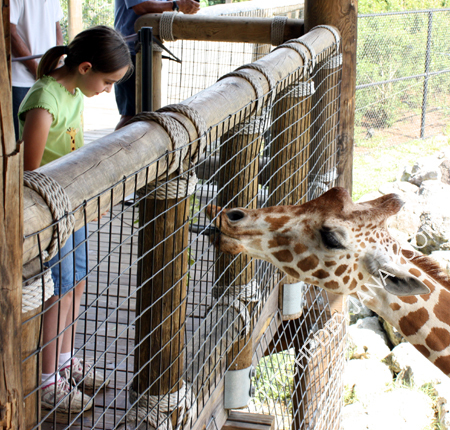 And here she is up close and personal feeding a giraffe. It was really cool! 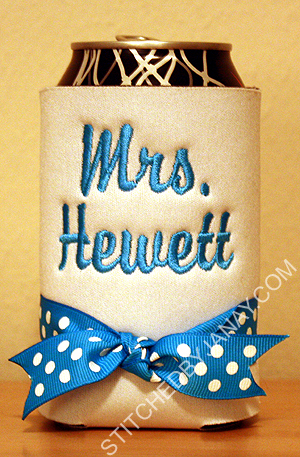 Isn't that SODA-lighted tag so cute? You can get here. 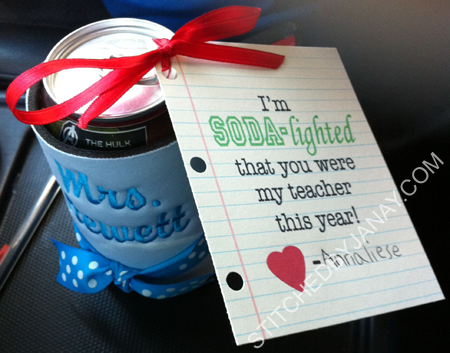 I attached it to this can kookie I made for Annaliese's teacher in their school colors. I used Embird alphabet #7 for the text. 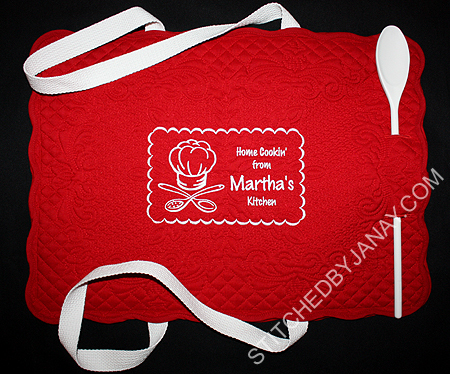 For Dashiell's beloved Ms. Martha I made a casserole carrier. She had admired mine at Thanksgiving, but I ran out of time at Christmas to make her one, and completely dropped the ball on getting it done for her birthday. Not knowing what their kitchen looked like I selected a neutral fabric (thanks Joy!). 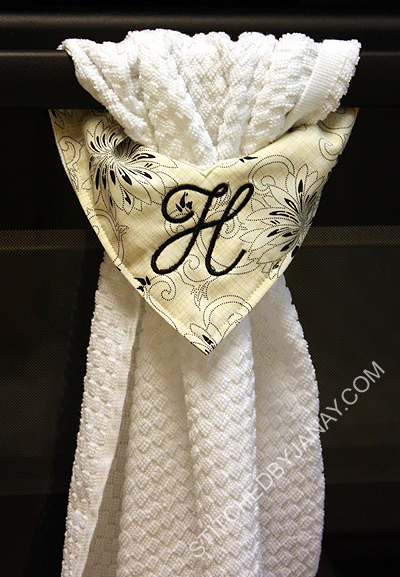 This time I placed the monogram on the fabric instead of the bottom corner of the towel. The H is Brass from 8CP. I also wanted to make a little something for their son. 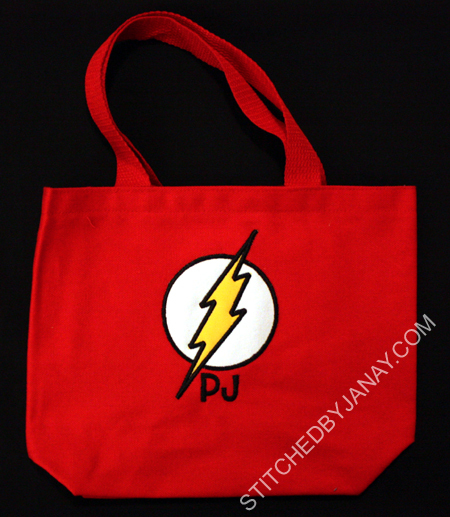 Daddy is such a big fan of the Flash that I figured PJ already had a shirt (I was right!) so I made this tote bag. I digitized the symbol myself (for personal use only) and added his name with Mandi from 8CP.